A discovery by Indiana University researchers could advance the long-term storage of nuclear waste, an increasingly burdensome and costly task for the public and private agencies that protect people from these harmful chemicals. In a study published Sept. 14, the scientists report they have developed a new chemical principle with the potential to revolutionize the creation of specially engineered molecules that extract radioactive elements from nuclear waste, significantly reducing the volume of these dangerous materials. The method is also applicable to molecules created to extract chemical pollutants from water and soil. “This work represents a major step forward in the effort to engineer specially designed nanostructures by providing a new, highly accurate method to predict how these molecules will behave in solution,” said lead author Amar Flood, a professor in the IU Bloomington College of Arts and Sciences’ Department of Chemistry. The research is reported in a cover article in the journal Chem. Flood said the study addresses the fact that it is nearly impossible to predict how efficiently an engineered molecule will perform in the real world. This is because chemists can currently only design molecules to function in isolation, despite the fact that molecules exist in combination—or “in solution”—with other molecules. Salt water, for example, is a solution of salt in water. He compared the situation to designing a machine in outer space and then placing it at the bottom of the ocean. The waterlogged device will not function the same as the original design. This is especially serious because creating artificial molecules to serve a specific function requires extremely precise design—like building a lock to fit a key. For example, a special molecule developed by Flood’s lab, called a cyanostar, consists of a five-sided star-shaped lattice of carbon and nitrogen atoms with an empty center—the “lock”—whose specific shape causes negatively charged molecules such as phosphates and nitrates—the “key”—to catch in the center and break off from their previous host. If the solution fills up or warps the lock, the key might no longer work. Structures such as the cyanostar are also known as “receptor molecules” because they are specially designed to receive specific molecules. In addition to accomplishing nuclear waste reduction, this technology may be used to remove chloride from water—a part of the process used to convert seawater into freshwater—to eliminate excess chemical fertilizers from soil, or to gather lithium ions used in renewable power. With the methods reported in the paper, Flood said, chemists can start to design new molecular reactions with the end goal in mind. Specifically, the new principle finds that the attraction between receptor molecules and negatively charged ion molecules is based on the dielectric constant of the solvent in which they’re combined. A dielectric constant is a measurement of a substance’s ability to stabilize electrical charge. To test their method, the IU team applied their newly developed chemical principle to triazolophane—a molecule designed to extract chloride from surrounding molecules—in combination with chemical solvents commonly used in reactions to remove unwanted ions from other liquids. In each case, the principles discovered by Flood’s group accurately predicted the molecules’ effectiveness. The primary researcher responsible for the method is Yun Liu, a Ph.D. student in Flood’s lab. 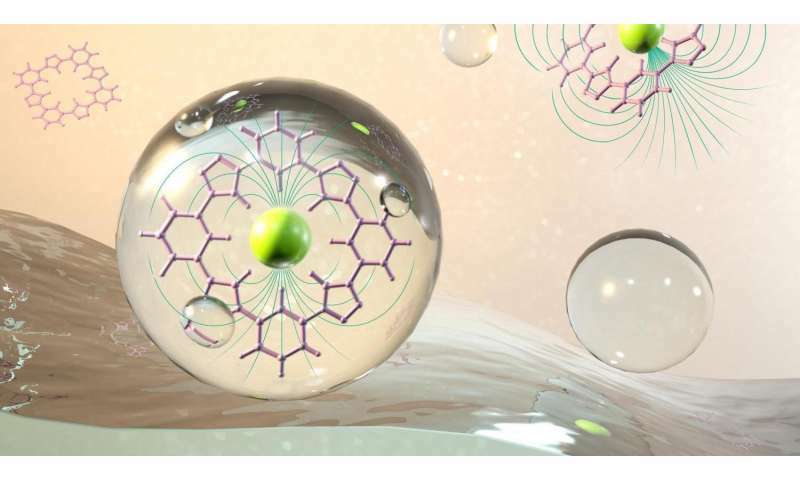 The team also noted that the ability to accurately predict how a molecule will function in solution will assist in the development of highly accurate computer simulations to rapidly test chemically engineered molecules designed to achieve specific effects.